Earned value is a powerful tracking and budgeting feature in Project. Despite the slew of intimidating acronyms that defines it (like AC, BCWP, TPI, EV, and the like), it isn’t especially complicated. Earned value helps you answer questions like, “Looking at the amount of work done so far in this project, how much money were we supposed to have spent?” Which then leads to other questions like, "Will we finish on time?" A simple example You’re working on a gardening project for 10 homes in a cul-de-sac, and you expect to get the entire project of 10 homes done in 10 months. Further, you need to complete one home’s garden in each month. Let’s walk through some of the details on this project. $10,000 is your total budget for all 10 homes. $1,000 is budgeted for each home, which means you plan to spend $1,000 per month on the entire project. This includes money spent on plants, tools, and a gardener. Then you realize your mistake. After 2 months’ time, 20 percent of the project should have been done, because 2 months is 20 percent of the 10 months that you had originally planned to spend on the project. But only one and a half gardens are actually done, not 2. So, after two months, you should have spent 20 percent X $10,000 (or $2,000) on the project to get it done on time, and two gardens should be complete—not $1,500 for one and half gardens. Now you realize you’re actually behind schedule. Yikes! Time to have a talk with the gardener. Here’s the tricky thing (and great thing) about earned value. It marries time with money because it multiplies currency by scheduled time (or percent complete, in the jargon of professional project managers). The lesson? “Time is money,” as the old saying goes. Now, you can’t boast your prowess with earned value quite yet. You need to read on . . .
Project displays earned value information two ways: with views and with reports. But first you need to do a few things to set up earned value for reporting. Choose Project > Reports > More Reports. Choose Costs, and then choose Earned Value. 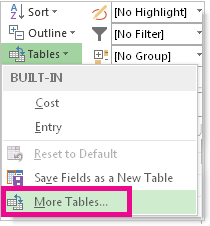 Choose View > Table, then choose More Tables. In the list, select Earned Value, Earned Value Cost Indicators, or Earned Value Schedule Indicators. If you’re not sure which table, just pick Earned Value. Three key values are at the root of earned value analysis, and you pretty much need to know at least these three values to use earned value. Planned value (PV) This also known by the acronym BCWS. This is the budgeted (or baseline) cost of tasks estimated at the start the project plan, based on the costs of resources assigned to those tasks, plus any fixed costs associated with the tasks, up to the status date you choose. For example, the total planned budget for a 4-day task is $100 and it starts on a Monday. If you set the status date to the following Wednesday, you’ll see that the PV is $75. However, with this value, you don’t know how well your project is doing. Actual Cost (AC) This is also known by ACWP. This is the actual cost required to complete all or some portion of the tasks, up to the status date. For example, if the 4-day task actually incurs a total cost of $35 during each of the first 2 days, the AC for this period is $70 (but the PV is still $75). However, with this value, you don’t know how well your project is doing. For example, if you planned to get a lot more work done for that same $70, that doesn’t sound good. You need to know (you guess it) earned value to fully assess the efficiency of your project. This is the value of the work performed by the status date, measured in currency. For example, if after 2 days 60% percent of the work on a task has been completed, you might expect to have spent 60 percent of the total task budget, or $60. If it turns out that you spent $80, then you can safely say you’re over budget and behind schedule. Ouch! An important theme running through these common earned value terms is the status date. Earned value analysis assumes you want to see the progress on your project prior to a specific point in time that you choose. Because a picture is worth a thousand words, let’s look at this graphically. Here’s a chart showing a steady accumulation of cost over the lifetime of a project. The dotted line shows a steady expenditure over the lifetime of the project. After work on the project has begun, a chart of the key values of earned value analysis may look like this. The status date determines the values Project calculates. The actual cost (AC) of this project has exceeded the budgeted cost. The earned value (EV) reflects the true value of the work performed. In this case, the value of the work performed is less than the amount spent to perform that work. The earlier in a project's life cycle you identify such discrepancies between actuals costs, budgeted costs, and earned value the sooner you can take steps to remedy the problem. Easier said than done. 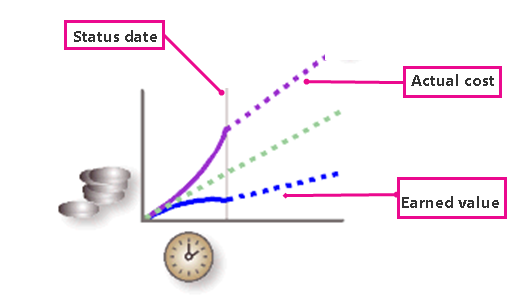 The more work you get done before the next status date for determining earned value, the better. Simply hiring more workers may not help, but hiring cheaper workers might. Or you may need to “walk the floor,” to find out why workers aren’t being more productive. Or maybe the problem is with the managers who are providing machinery that needs more maintenance than expected. There could be many reasons, but the point is, using a “numbers approach” with earned value will help you spot negative trends. Don’t chase after productivity problems on those tasks that are less important than others. Check tasks on the critical path first for the greatest impact on positive earned value numbers. An earned value analysis at the end of a project really has little value. The sources of your project’s problems is likely early in it, and will likely have had too much impact to correct without incurring great cost and frustration from your team, manager, and other stakeholders. Get in the habit of running earned value reports monthly, if you’re going to do them at all. If you see problems very early in the project, it could just be ramp-up costs, or the costs of training, getting everyone on-board, abundant but necessary early collaboration with your team, and other housekeeping chores. Don’t ignore these early signs of trouble, but they may be more understandable early in the project than later.